The Beck surname is German in origin. Johann Frederick Beck was born circa 1720 in Germany. He died circa January 1800 in Granville Co., North Carolina. He married Anna Elisabeth Braunin on October 30, 1737 in Katzenroth, Germany. They had at least six children: Johann (see next generation), Frederick, Catherine, David, Michael, and Molly. Johann Frederick married Anna Elisabeth Braunin on October 30, 1737 in Katzenroth, Westerwald, Germany. 2 Frederick Beck was born circa 1742. 3 Catherine Beck was born in November 1765 in North Carolina. She died on April 3, 1845 in Morgan Co., Indiana. She married William Henry Sandy. 4 David Beck was born circa 1766. He died about 1855. 5 Michael Beck was born circa 1769. He died in Tennessee. He married Ann. 6 Molly Beck was born circa 1770. She died before 1817. She married David Brogden on March 23, 1798 in Wake Co., North Carolina. Johann Martin Beck was born on August 17, 1740 in Westerwald, Germany. He died on September 12, 1819 in Forsyth Co., North Carolina. He came with his family to North Carolina in his youth. There in about 1763, he was married to Maria Catherina Gibler. They lived in Stokes and Forsyth County, North Carolina and were farmers. They had at least eight children: William, Frederick, Sarah, Solomon (see next generation), Clara, Salome, Henry, and Abraham. Johann Martin lived the rest of his life in Forsyth County, North Carolina. He died there on September 12, 1819, at the age of 79. It is said that he is buried in the Beck-Shouse Cemetery in Forsyth County. His widow Maria is said to have died in Stokes County on December 23, 1824. Johann Martin married Maria Catherena Gibler in 1763 in Granville Co., North Carolina. She was born on December 25, 1742 in Germany. She died on December 23, 1824 in Bethebara, Stokes Co., North Carolina. 1 William Beck was born on February 12, 1766 in Granville Co., North Carolina. He died on February 7, 1845 in Forsyth Co., North Carolina. He married Christina Huffman in 1788 in Granville Co., North Carolina. 2 Frederick Beck was born circa 1768 in Stokes Co., North Carolina. 3 Sarah Beck was born circa 1770 in Stokes Co., North Carolina. 5 Clara Beck was born circa 1774 in Stokes Co., North Carolina. She married John Geiger on March 21, 1796 in Stokes Co., North Carolina. 6 Salome Beck was born circa 1775 in Stokes Co., North Carolina. She married Heinrich Kapp on August 17, 1798 in Stokes Co., North Carolina. 7 Henry Beck was born on April 5, 1777 in Stokes Co., North Carolina. He died in Union or Montgomery Co., Indiana. He married Sally Jean on September 1, 1804 in Stokes Co., North Carolina. 8 Abraham Beck was born on March 6, 1782 in Granville Co., North Carolina. He died on February 17, 1860 in Boone Co., Indiana. He married Rebecca Eliza Winchester on May 18, 1815 in Stokes Co., North Carolina. Solomon Beck was born on May 1, 1772 in Stokes County, North Carolina 7. He died on January 1, 1833 near Beckville, in Walnut Twp., Montgomery Co., Indiana 7. He is buried in the Providence Cemetery, Walnut Twp., Montgomery Co., Indiana. Solomon spent the majority of his early life in Stokes County, North Carolina. He was married there on December 4, 1797 to Elizabeth Peeler, daughter of Anthony Peeler. They had thirteen children: John (see next generation), Anthony, William, Henry, Solomon, Jesse, Jeptha, Mary, Charity, Elizabeth, Eliza, Nancy, and Martha. In 1811, Solomon and his family moved out west and they settled on a farm in Wayne (became Union in 1821) County, Indiana. They did not remain there for long and probably in the late 1820's or early 1830's, they moved west to Montgomery County, Indiana. There, they settled in Walnut Township, at what would become the community of "Beckville." Solomon died there on January 1, 1833, at the age of 60. Elizabeth died there on June 27, 1839. Solomon was married to Elizabeth Peeler on December 4, 1797 in Stokes Co., North Carolina 8. She was born on July 7, 1777 in Rowan Co., North Carolina 7. She died on June 27, 1839 near Beckville, in Walnut Twp., Montgomery Co., Indiana 7. She is buried in the Providence Cemetery, Walnut Twp., Montgomery Co., Indiana. 2 Anthony Beck was born on February 22, 1800 in Stokes Co., North Carolina 7. He died on September 10, 1881 in Walnut Twp., Montgomery Co., Indiana 7. He is buried in the Pisgah Cemetery, Walnut Twp., Montgomery Co., Indiana. 3 William Beck was born on May 15, 1802 in North Carolina. He died on May 15, 1891 in Forsyth Co., North Carolina. He is buried in the Beck-Shouse Cemetery, Forsyth Co., North Carolina. He married first Mary Elizabeth Null on December 8, 1824 in Bethebara, Stokes (now Forsyth) Co., North Carolina. (She was born on September 11, 1797 in Stokes (now Forsyth) Co., North Carolina. She died on January 1, 1862 in Forsyth Co., North Carolina. She is buried in the Beck-Shouse Cemetery, Forsyth Co., North Carolina.
. He married second Laura C. Vogler on December 30, 1863. 4 Solomon Beck was born on January 18, 1806 in Stokes (now Forsyth) Co., North Carolina. He died on August 25, 1881 in Edgar Co., Illinois. 5 Henry Fletcher Beck was born on January 1, 1808 in Stokes Co., North Carolina 7. He died on January 1, 1868 in Walnut Twp., Montgomery Co., Indiana 7. He is buried in the Pisgah Cemetery, Walnut Twp., Montgomery Co., Indiana. 6 Jesse Beck was born on January 4 or 5, 1809 in Stokes (now Forsyth) Co., North Carolina. He died on April 25, 1839 in Montgomery Co., Indiana. He is buried in the King of Peace Cemetery, Walnut Twp., Montgomery Co., Indiana. 7 Jeptha Beck was born on August 21, 1809 in Stokes Co., North Carolina. He died on December 18, 1877 in Walnut Twp., Montgomery Co., Indiana. 8 Mary Beck was born circa 1811 in Stokes Co., North Carolina. She died on September 3, 1882 in Wakeeney, Trego Co., Kansas. 9 Charity M. Beck was born on February 8, 1813 in Stokes Co., North Carolina. She died on January 3, 1860 in Allen Twp., Polk Co., Iowa. 10 Elizabeth Beck was born on October 2, 1814 in Wayne (now Union) Co., Indiana. She died on September 5, 1847 in Montgomery Co., Indiana. 11 Nancy Beck was born on February 6, 1818 in Wayne (now Union) Co., Indiana. She died on September 14, 1882 in Jackson Twp., Boone Co., Indiana. She is buried in the Pisgah Cemetery, Walnut Twp., Montgomery Co., Indiana. She married first William W. Roberts on February 14, 1838 in Montgomery Co., Indiana. (He was born on May 22, 1812 in Kentucky and died on October 27, 1848. He is buried in the Pisgah Cemetery, Walnut Twp., Montgomery Co., Indiana. 12 Durham Beck was born on June 7 or July 16, 1821 in Union Co., Indiana. He died on February 4, 1855 in Walnut Twp., Montgomery Co., Indiana 7. He is buried in the Providence Cemetery, Walnut Twp., Montgomery Co., Indiana. 13 Martha Melvina Beck was born on November 12, 1823 in Union Co., Indiana 7,12. She died on February 11, 1906 in New Ross, Montgomery Co., Indiana 7,10,12. She is buried in the Pisgah Cemetery, Walnut Twp., Montgomery Co., Indiana. John Beck was born on September 30 (or 29), 1798 near Bethebara, in Stokes County, North Carolina. He died on October 13, 1876 in Center Twp., Boone Co. Indiana 5,9. He is buried in the Beck Cemetery, Center Twp., Boone Co., Indiana. In 1811, John moved with his family out west and they settled in Indiana. They lived in the part of Wayne County, Indiana, that became Union County in 1821. It was while living there that John was married in 1818 to Judith Chinault. 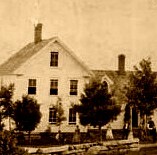 John and his family remained in Union County until 1836, when he moved to Boone County, Indiana. There, they settled on a farm in Center Township, three and a half miles northwest of the city of Lebanon. John and his wife were faithful members of the Baptist church and are said to have been well loved. John married Judith Chinault on June 18, 1818 in Wayne (now Union) Co., Indiana 1. She was born on January 9, 1799 in Rockingham Co., North Carolina 5. She died on August 3, 1875 in Center Twp., Boone Co., Indiana 5,9. He is buried in the Beck Cemetery, Center Twp., Boone Co., Indiana. 2 Abner Chenault Beck was born on April 22, 1821 in Union Co., Indiana 13. He died on June 13, 1903 in Cooke Co., Texas 13. He is buried in the Spring Creek Cemetery, near Galveston, Cooke Co., Texas. 3 Solomon Wilson Beck was born on January 4, 1823 in Union Co., Indiana. He died after 1910 in Boone Co., Indiana. 5 William H. Beck was born on March 3, 1825 in Union Co., Indiana 5. He died on September 6, 1862 in Center Twp., Boone Co., Indiana 5. He is buried in the Beck Cemetery, Center Twp., Boone Co., Indiana. 6 John Franklin Beck was born on July 27, 1827 in Union Co., Indiana 5. He died on September 30, 1913 in Boone Co., Indiana 5. He is buried in the Beck Cemetery, Center Twp., Boone Co., Indiana. John Ellis Beck (c. 1864-??? 7 Samuel Larkin Beck was born on April 10, 1829 in Union Co., Indiana. He died on November 7, 1918 in Boone Co., Indiana 10. 8 Anthony Beck was born on May 15, 1831 in Union or Boone Co., Indiana 5. He died on November 4, 1900 in Boone Co., Indiana 5. He is buried in the Beck Cemetery, Center Twp., Boone Co., Indiana. He married second Sarah F. Cragun on November 8, 1893 in Boone Co., Indiana 6. 4 Jackson Beck was born in February 1834 in Union Co., Indiana 4. He died on January 19, 1911 in Washington Twp., Boone Co., Indiana 10. 9 Mary H. Beck was born on June 17, 1835 in Union Co., Indiana. She died on November 21, 1853 in Boone Co., Indiana. She is buried in the Beck Cemetery, Center Twp., Boone Co., Indiana. She married Robert S. Kerns on April 15, 1852 in Boone Co., Indiana 6. 10 George M. Beck was born in February 1838 in Center Twp., Boone Co., Indiana 4. He died on December 30, 1913 in Center Twp., Boone Co., Indiana 10. He is buried in the Beck Cemetery, Center Twp., Boone Co., Indiana. 11 Louisa Judith Beck was born on January 19, 1840 in Center Twp., Boone Co., Indiana 5. She died on March 25, 1861 in Boone Co., Indiana 5. She is buried in the Beck Cemetery, Center Twp., Boone Co., Indiana. 12 Zachariah Beck was born on March 11, 1843 in Center Twp., Boone Co., Indiana 5. He died on January 11, 1863 in Boone Co., Indiana 5. He is buried in the Beck Cemetery, Center Twp., Boone Co., Indiana. 13 Susannah Beck was born on April 20, 1844 in Center Twp., Boone Co., Indiana. She died on May 6, 1937 in Guthrie, Logan Co., Oklahoma. Elizabeth Peeler Beck was born on April 8, 1819 in Wayne (now Union) County, Indiana 2. She died on December 25, 1865 in Jefferson Twp., Boone Co., Indiana 2,3. She is buried in the Taylor Cemetery, Jefferson Twp., Boone Co., Indiana. She was named after her paternal grandmother, Elizabeth Peeler. Elizabeth was raised as a Baptist and lived with her parents in Union County, Indiana, where they were moderately successful farmers. In 1838 she was married to William Taylor, who lived in Boone County, Indiana. After the marriage, Elizabeth began living with her husband on their large farm in Jefferson Township, Boone County, Indiana, near the small village of Hazelrigg. Elizabeth had seven children: John, James, William, Abner, Francis, Mary and Martha. Although Elizabeth was apparently raised as a Baptist, her husband and in-laws were Presbyterians and she may or may not have converted to that faith. In political matters, Elizabeth's husband was a Democrat up until the Civil War, afterwards he became an Independent and supported the Union side in the conflict. It can be assumed that Elizabeth may have held the same ideals. Their home was built in 1847 on their farm which it is said to have comprised 640 acres and that they were the wealthiest farmers in that county. Elizabeth died at her home on December 25, 1865, at the age of 46. She was afterwards buried in the family cemetery (Taylor Cemetery) just outside of Hazelrigg, Indiana. Her husband afterwards remarried to Eliza Caldwell in 1875 and he died in 1890. Elizabeth married William Riley Taylor on November 15, 1838 in Union Co., Indiana 1. 3. Curtis, Grace C. Fahl-Fall and Allied Families. The Mercer Co., Ottumwa, IA, 1961. 9. Harden, Samuel. Early Life and Times in Boone County, Indiana. Harden & Spahr, Lebanon, IN, 1887. 13. Online cemetery index, Spring Creek Cemetery, Cooke Co., TX. (http://freepages.genealogy.rootsweb.com/%7Etexastrails/index/cemetery/aspcrk.htm).